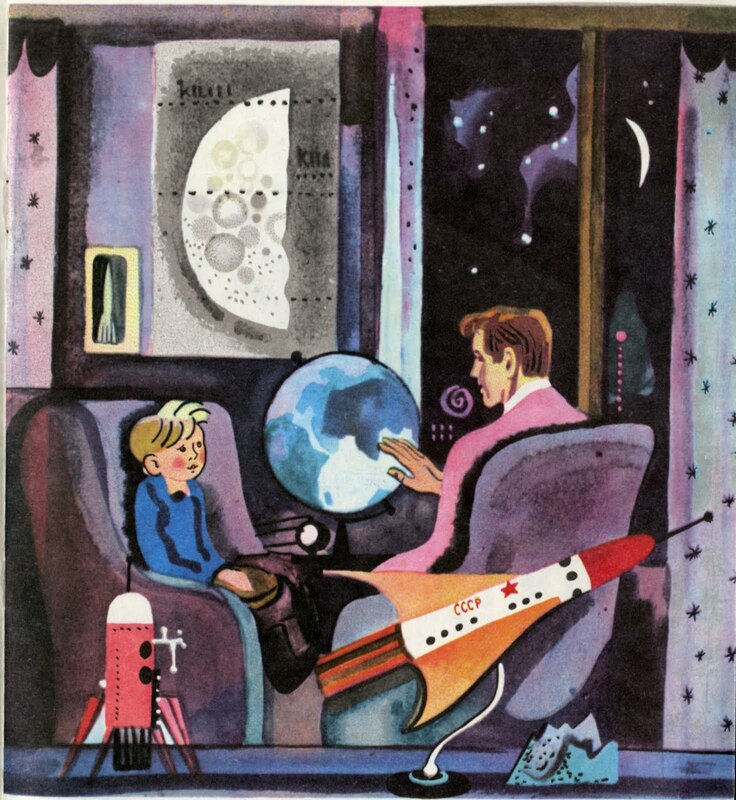 Non-fiction children's space flight stuff 1945-1975. 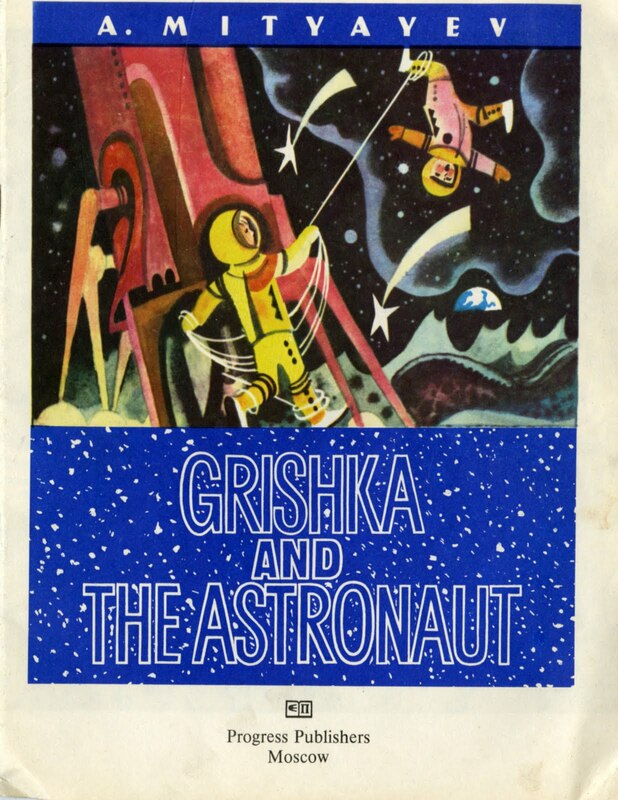 Grishka and the Astronaut was a 1970 fictional Russian story about how when a boy speaks to an astronaut for advice he is told to visit the Moon. The translation was done in 1981 as part of that flourish of children's books from Russia in the early 1980s that I have mentioned. 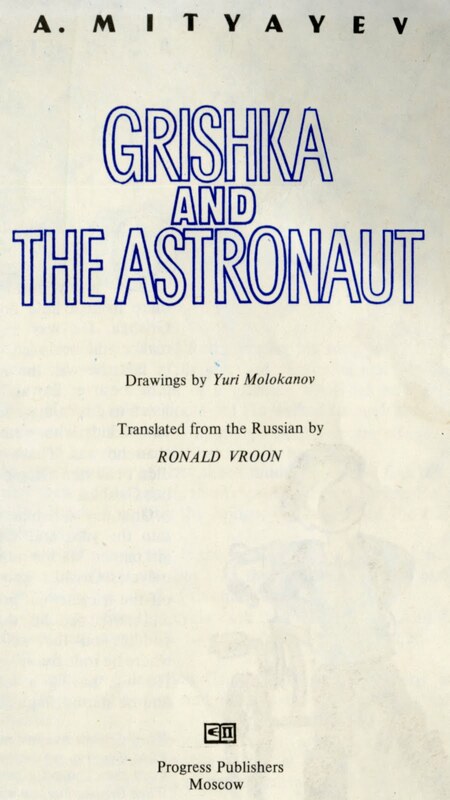 A. Mityayev ; drawings by Yuri Molokanov ; translated from the Russian by Ronald Vroon. 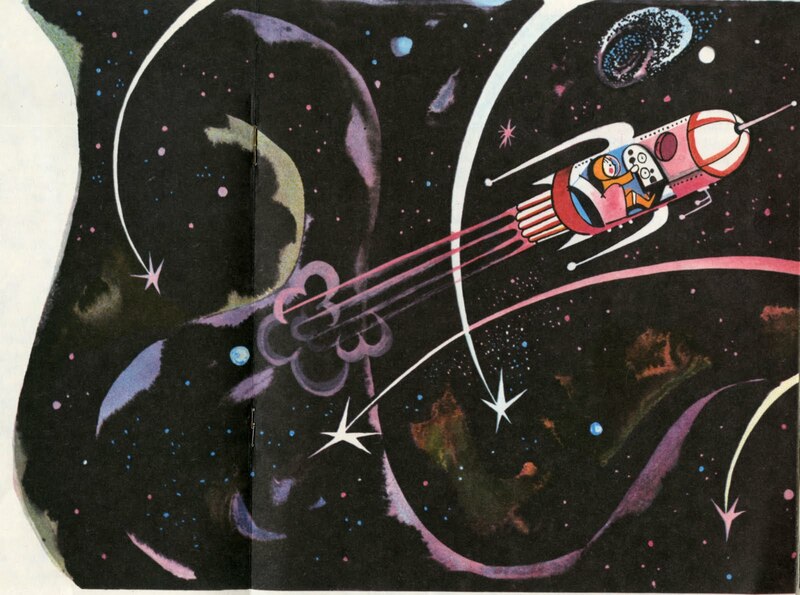 Translation of: Kosmonavt i Grishka.(1970). Moscow : Progress ; [London] : distributed by Central, 1981 [20 p.] : 28 cm. The illustrations by Yuri Molokanov are especially charming. I picked out some of my favorite rocket related ones to share with you today. Talking with the astronaut (shouldn't that be cosmonaut?) at his house. I especially like the decorations and models the astronaut has at his house. A very nice and understated picture of a rocket launch. 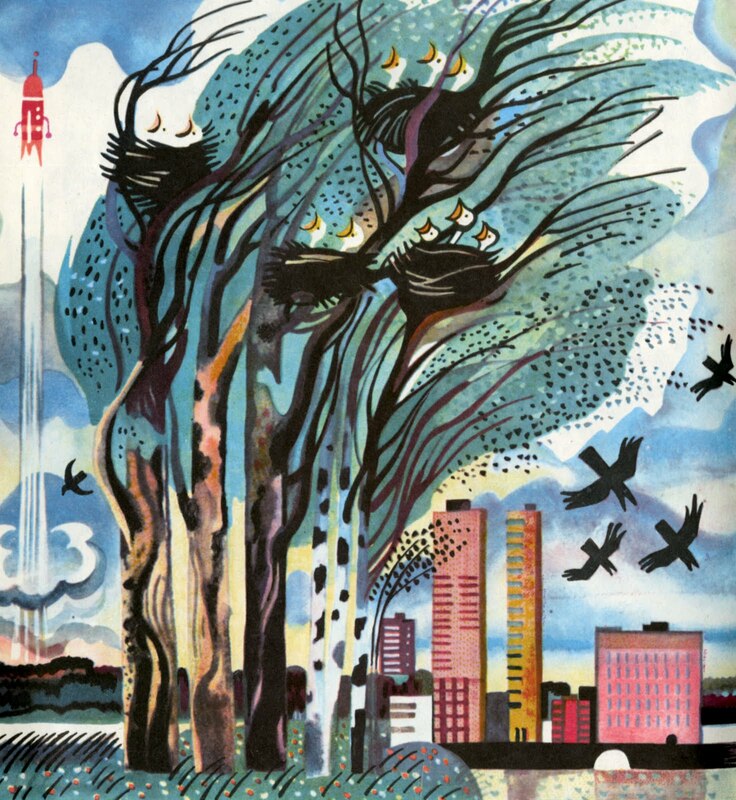 The text describes how as the rocket launched leaves fell from the trees and the birds scattered. Flying through space to the Moon. 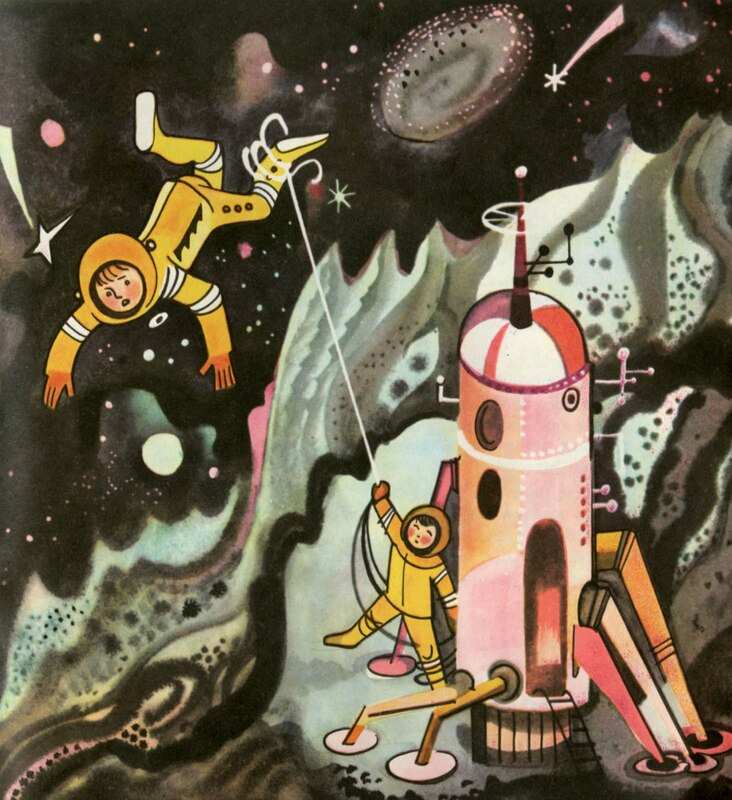 The joys of leaping on the Moon. Even better than leaping on the Moon is the ability to lift huge boulders because of the lowered gravity. I wonder if the Apollo astronauts ever tried anything similar or was it too dangerous/silly? Landing on an asteroid and having to be rescued by a friend he found. 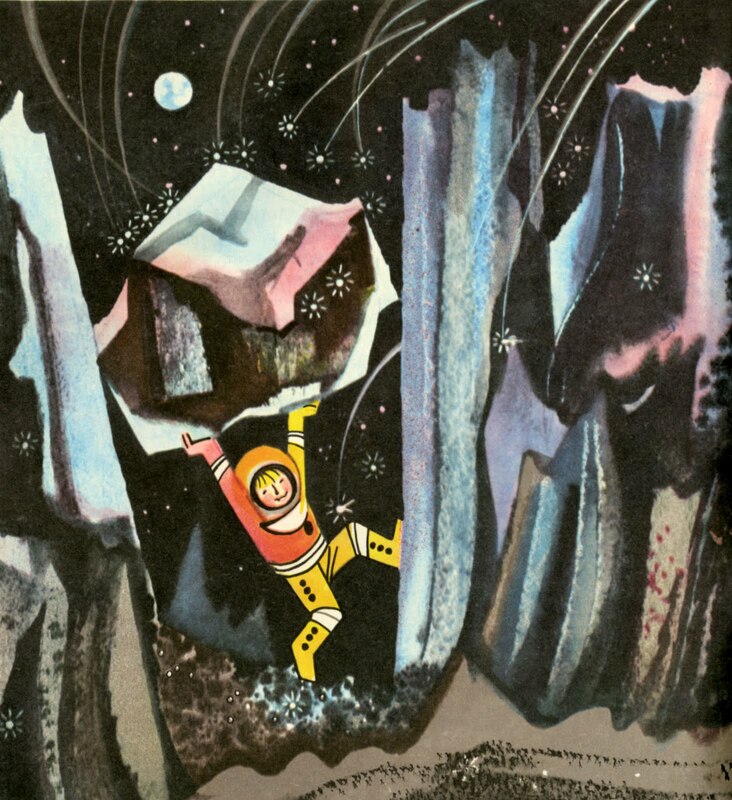 And maybe my favorite illustration: playing volleyball with boulders on the Moon. Outside of the dangers of breaking your helmet this seem almost cooler than baseball on the Moon. Dreams of space included playing games with your friends in new places. This book is so pretty, the illustrations are just perfect, very warm and dynamic. Will try to find a copy somewhere! I want to see the last image of the book where the boy and a girl with their dog. I am Indian (kolkata) and read this book in Bengali language in 1985. Please publish this image referred above. got a tattoo of grishka at space !! Any comments or questions, email me. Where on Earth are you? John Sisson. Watermark theme. Powered by Blogger.